The following post was written by Belinda Paine, an eighth grade special education teacher and one of my credential students. She wrote this string and used it both with her eighth grade students and her fellow credential students. Enjoy! As an instructor of students with disabilities, I review many concepts in math that my students find challenging. One concept is the idea and notion of decimals. At first I thought students just visually couldn’t see the decimal, then I realized they were overwhelmed by the idea of place value. My students seemed to ignore the decimal altogether or completely gave up on the problem. 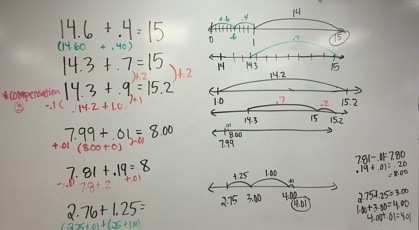 I wrote this number string to help my students connect decimals to strategies we used for whole numbers, like compensation. I thought that negative reaction to decimals would only be my eight grade students. Little did I know, that when presenting this same number string on decimals to adults, the other students in my credential class, I would get the same reaction. Hands on the forehead, pressing their strands of hair back, eyes wide open and the dreaded sounds of, “Ughhhhhhh” from my peers. It blew me away. Many are uncomfortable with dealing with decimals. As a see thumbs go up, I noticed some students had already given up at the first sight of a decimal. I asked a student who looked confident to answer the question. For my students I would remind them how many pennies or cents are in a dollar before beginning this problem (some have not memorized this as a known fact). Adults initially seemed confused, but soon realized this was something they had memorized as a known fact. Thumbs quickly shot up in confidence. “I think it’s uhhh 8.2” “Ok, great, can you tell me how you got that?” “I just did it like the problem before, where I look .99 and added a penny. Then I got the dollar and added it to the 7, which is 8. Then I had the 2 left over for the decimal, so it’s 8.2” Thumbs fly up. It’s interesting how the placement of certain numbers can mix up a person’s thinking. Initially, all the problems had been shown with the bigger number first, and then the smaller number added to it. I saw big eyes for a second, but the students quickly realized there was an easier way to solve the problem without using an algorithm. It was not a scary decimal problem! Students and adults both solved this problem by making friendly numbers or using compensation. Some thinkers used +/-.11 using compensation to make the friendly 1.00, add it to the 4, and have a penny left over to make 5.01. And it was great to see students who were shutting down now attempting to solve the problem mentally, breaking the problem up into numbers they knew. Some added .89+.01 to make .90 then added .11 to make 1.01, next adding the 4.00. The grand total still being 5.01. Students and adults proceeded to tell me that they thought, “it was going to be harder.” I even heard, “My head still hurts, but now the numbers don’t seem so scary.” As an instructor who accepts “the struggle” as learning, I appreciated these comments, hoping they wouldn’t be daunted by the idea of decimals in the real world. Think this string is great! Just wondering if anyone has done any strings for multiplication and division of decimals. Definitely! There are some strings for that in Minilessons for Operations with Fractions, Decimals and Percents, and also Pamela Harris has some in her book. Same properties apply as to whole number multiplication and division, just with the added place value dimension that decimals bring.